Over the years, in my family, a roast chicken (or two) has become a staple at our family gatherings. There's something so familiar and comforting about it. Now that we've moved to a different country, I still find myself longing for those gatherings or maybe, just maybe, what I'm really longing for is a good roast chicken, lol. I recently picked up a whole bird from the supermarket. I usually pick up an RSPCA approved product. My take on a roast chicken is usually a very simple, yet flavorful marinade. Of course, you can serve this chicken up at a regular weekend meal or even at a more prominent family get together or party, by putting up some clever sides. I will share some ideas for sides over time. For today, we'll stick with the roast chicken. So if you've never made a roast chicken at home before, this is a good recipe to start with. Chances are you'll already have all the ingredients in your pantry. I'm sharing this recipe with you today so that you have a little time to try this out before Easter and then maybe, serve it up for Easter as well. When roasting a chicken, the cooking time will vary based on the sized of the bird. After doing a little reading up, a common rule of thumb for cooking time is 45 minutes per kilo of chicken + 20 minutes. I use this as a guide and this is something you should keep in mind if you've never roasted a chicken before. How do you work out cooking time required for a good chicken roast? Wash and pat the chicken dry using paper towels. Spread all the marinade ingredients on the chicken as well as in the cavity and rub it in well, almost like a massage. Leave to rest for about an hour. This time around, I placed the chicken on the rack in the roasting tray. I think it works well. This way the chicken isn't cooking in the liquids. The skin turns out crisper. Place the chicken in the hot oven. After about 10 minutes, lower the oven temperature to 180°C. Bake for required time till the chicken is cooked. Halfway through the cooking process, I baste the chicken with the some olive oil. Please note the cooking time instructions above. To check if the chicken is cooked well, insert a sharp knife in the joint where the leg joins the body. If the juices run clear, the chicken is cooked. If it is still pink, the chicken needs to cook more. When the chicken is cooked, cover with foil and let it rest for about 10 minutes. Serve up with your favorite sides. What are some of your favorite sides? I'd love to hear from you. 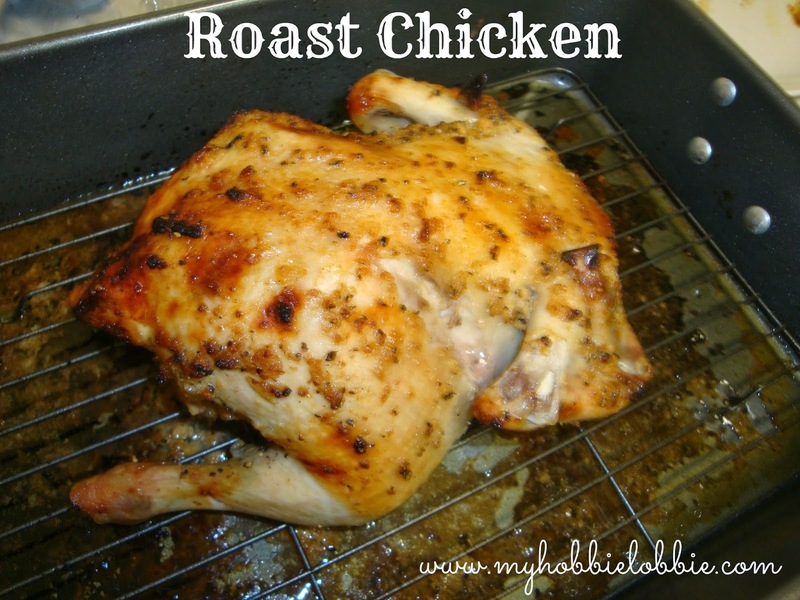 Mmmm, I love roast chicken...easy and so delicious.